Teaching Blog Round Up: Getting Organized for Guided Reading! Hi everyone! It's Angie from The First Grade Scoop here. With the new year, I always set organizational goals. I had a few tips to share with you to help get your anecdotal notes and plans organized for your guided reading groups! Then, I have a little binder pouch of extra documents. I put my running record forms and guided reading anecdotal labels in here. There are my guided reading notes labels. I print them on Avery 5163 labels (although I get mine from Costco... MUCH cheaper as I go through a LOT during the year!). I take notes on these, rather than on paper, and I stick them in each student's section (you'll see that in a second). I also include a copy of my guided reading schedule with my group names and the students' names. As you can see, I confer with Jesus (he's reading a significantly different level than the other students, so I need to meet with him one-on-one). 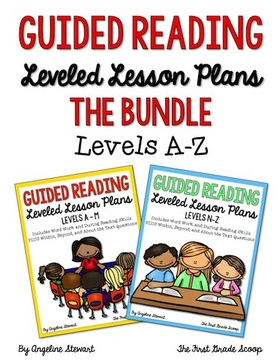 Next, I have binder tabs that separate my guided reading lesson plans by level. I teach first and haven't needed plans past an N, so I only have up to N here. 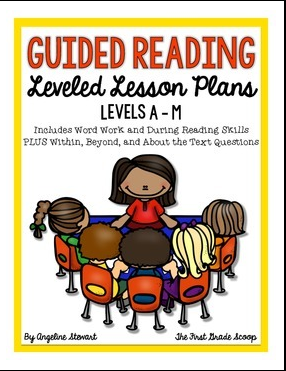 Then, I have my guided reading lesson plans. (More about those in a second.) I have plans for each book I use with students, then I reuse the plans, tweaking as necessary, each time I read the same book with a new group of students. They are a LIFESAVER!!! ... a sheet of cardstock with that child's anecdotal notes on them. After each guided reading group, I pull the child's note label and stick it on his/her cardstock. Looking at these sheets is a quick and easy way for me to figure out how a child is progressing, and with my notes sticking with the individual student and not the group, I can better track student progress as students move in and out of reading groups. So, voila! It's not fancy, but it is extremely helpful for me in organizing my student anecdotal notes. 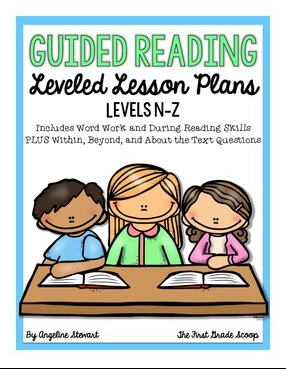 If you're interested in my guided reading lesson plans, you can check out the products below. They truly make my planning life so much easier!